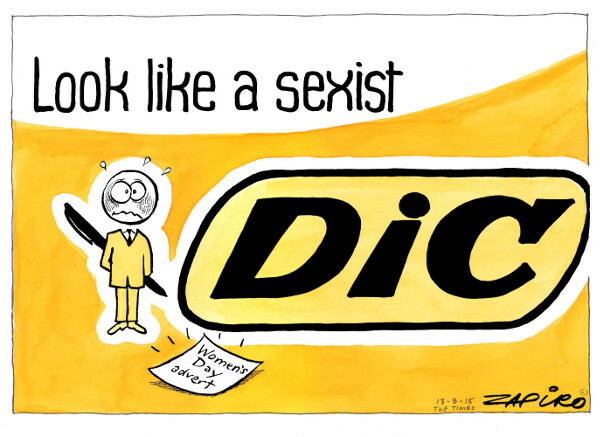 Zapiro has taken on pen manufacturer Bic South Africa, after the company’s recent Women’s Day blunder. 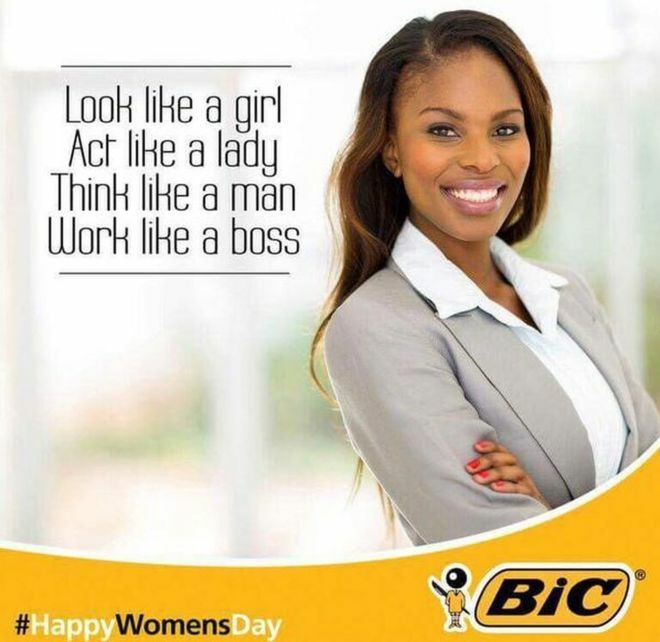 Bic South Africa’s Facebook page published a picture of a woman in a suit with the words, “Look like a girl, act like a lady, think like a man, work like a boss”, along with the hashtag #HappyWomensDay. Many people took to social media to express their outrage, which was predictably followed by people expressing outrage at the initial outrage. Bic apologised for the gaffe, but many took issue with their apology, on the grounds that it did not take enough responsibility for the mistake. The company then apologised again, and deleted the picture from their Facebook and Twitter pages. The story has since been taken up by international media in the UK and USA. #Bic should've stuck to having clowns doing handstands in their adverts rather than getting clowns to write their adverts. Next from Bic: "Work like a black, think like a white". "Oh sorry we just took it from this KKK blog"
As a pen brand you'd think BIC would know where to draw the line. Haha. Hour 3 of thinking like a man. My chocolate cravings have completely disappeared and I've been promoted. What makes a working mother and average athlete decide to take on a massive physical and mental challenge to run, cycle and kayak the perimeter of South Africa, covering 6 772 km in less than five months? Kim van Kets was inspired by her desire to demonstrate to her daughter the fact that mothers are heroes too. Married to adventurer, Peter van Kets (2x Atlantic Rower and only African to have rowed solo across any ocean and one of the few South Africans to have trekked to the South Pole, detailed in his book The Eight Summit), she was able to justify the ‘time-out’ after having built up a credit balance of 150 days owed to her by her husband. Her story is a positive and enthusiastic ‘off the beaten track’ South African adventure and is amusing, anecdotal and inspiring. It tells of the physical and mental challenges of the journey but focuses on stories surrounding the people and places she encountered along the way, including those of the ancient Kalahari farmer who pronounced her to be a ‘Ramkat’ and the Nama goatherd who seemed doubtful about her gender and anxious to be rid of her. The book is also a wonderful South African travelogue and is studded with nuggets of history and fascinating trivia about the plants, animals, characters and places as well as brief summaries of important life lessons the journey highlighted for the author. It will leave the reader feeling up-beat, inspired and eager to explore the splendour of the Beloved Country and its people. Kim van Kets was born and raised in the rural areas of the Eastern Cape, studied law at Stellenbosch University, was admitted as an attorney and spent many years in legal practice and the corporate world. She is currently self-employed as a legal consultant/corporate trainer, freelance writer, author and motivational speaker who works just enough to enable her to stay out of the poor-house and run in interesting places. Although she insists she is a very average runner, Van Kets has a tank-like ability to keep going and has taken part in numerous multi-day and self-supported ultra-distance off-road races. Despite opportunities to have married somebody sensible, she is married to adventurer, Peter van Kets (2x Atlantic Rower and only African to have rowed solo across any ocean and one of the few South Africans to have trekked to the South Pole). Van Kets is also mother to nine-year-old Hannah who plans to be (among other things) an extreme rock-climbing hip-hop-dancing artist/archeologist when she grows up. Rarely has The Book Lounge been as full as it was last night for the launch of VuvuzelaNation: Zapiro on SA Sport 1995-2013 by Zapiro (Jonathan Shapiro), with text by Mike Wells. Large screens were erected in both seating areas, upstairs and downstairs, with a record number crammed inside to enjoy the presentation. The sparkling wit and rapid fire repartee between the authors kept everybody dabbing tears of mirth as the authors inspected the hilarious history of South African sports. This book also has more words than the typical Zapiro cartoon collection, said Sloman. “We have journalist and broadcaster Mike Wells to thank for that. The way they’ve dovetailed each other makes this a remarkable book,” he said. The evening ended with a long queue of fans waiting to get their copies signed by the duo of authors. Everyone who bought a book enjoyed a kind word or shared an anecdote on this sparkling evening. Follow Liesl Jobson (@LieslJobson) on Twitter for more! 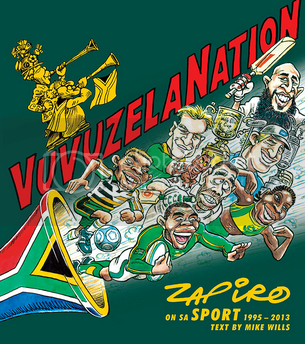 Jacana Media, Zaprock Productions and The Book Lounge are thrilled to invite you to the launch of VuvuzelaNation: Zapiro on SA Sport 1995-2013 with the text written by Mike Wells. Zapiro will present a selection of cartoons and will be in conversation with Wells. The presentation will be screened upstairs and downstairs at The Book Lounge on Tuesday 23 July at 5:30 PM for 6 PM. VuvuzelaNation is a collection of more than 200 iconic cartoons from the nation’s sharpest bestselling cartoonist telling the curious, glorious, calamitous and chaotic story of sport in the New South Africa. With incisive text from journalist Mike Wills, this new Jacana title provides a keen-eyed, irreverent look at everything from Kamp Staaldraad to Bok World Cup glory, from cricketing chokers to champions, from SAFA bungling to the emotional success of the 2010 FIFA World Cup. An extraordinary cast of colourful sporting characters has been captured by the pen of Zapiro over the past twenty years – Louis Luyt, Hansie Cronje, Caster Semenya, Herschelle Gibbs, Benni McCarthy, Bryan Habana, Lucas Radebe, Peter de Villiers and Oscar Pistorius among them – and this book promises a comprehensive and entertaining look at our nation’s favourite pastimes. Zapiro is Jonathan Shapiro. Born in 1958, he survived school in Cape Town, architecture at UCT, conscription, activism, detention and a Fulbright Scholarship to New York before finding himself, and starting to irritate public figures, as South Africa’s best known cartoonist. He has worked for the Mail & Guardian since 1994, the Sunday Times since 1998 and has contributed to many other major newspapers. He has published seventeen best-selling annuals and The Mandela Files. In addition to numerous local and international cartooning accolades, Zapiro has won the SA Comedy Award and Vodacom Journalist of the Year, and been awarded an Honorary Doctorate in Literature. Born in Sydney and a history graduate from Cambridge University, Mike Wells occasionally finds ways to turn his obsession with sport into something resembling paid work. He provided a wry weekly sports column for the Saturday Cape Argus for 11 years and is the author of The Cycle Tour. He lives in Cape Town from where, with unrequited passion, he follows Spurs, Ajax, the Stormers and the Cobras. He is also a regular current affairs radio talk show host on 567 Cape Talk and Talk Radio 702 and sometimes crosses over to the dark side to work in advertising & PR. There are few rural spaza shops in the Eastern and Western Cape, according to Kevin Davie, although they are plentiful in the provinces of Limpopo, Mpumalanga and ­KwaZulu-Natal. While pedalling up, down and around the fortress-like mountain range that dominates most of these provinces, a range of “crushing beauty” known as uKhahlamba in isiZulu, Intaba Zokhahlaba in isi-Xhosa, Maluti in Sesotho and Drakensberg in Afrikaans and English, Davie would often stop for a drink, usually a Coke. Jacana Media has shared a flipping preview of Freedom Rider: 10 000km by Mountain Bike across South Africa by Kevin Davie. The preview comprises the foreword by David Waddilove, the founder of the Freedom Challenge, the prologue by Davie and part of the first chapter, which includes photographs showing the diverse riding conditions that Davie encountered during his journey across South Africa. Some years ago I read about The Great Dance, Craig and Damon ­Foster’s documentary, which filmed Karoha, a Kalahari Bushman, as he ran down his prey. I tried to track it down, and made enquiries on and off, but without success. Then I found it on YouTube and was fascinated by this exploration into another age. I have run 11 Comrades marathons and wondered whether I could claim to have run down that many kudus. Jacana is pleased to invite you to the launch of Kevin Davie’s Freedom Rider: 10 000km by Mountain Bike across South Africa. Davie will be at the Delta Environmental Centre on Sunday 10 February from 9:30 AM to 11:00 AM to discuss his mammoth journey, share some of the best photographs taken along the way and sign some books. This is riding minimalism, the rider carrying all his requirements without any back-up vehicle. Freedom Rider is not only an adventure story about an epic bike ride in extreme conditions but a foray into the histories and cultures that have made South Africa what it is today. When journalist Kevin Davie started riding his mountain bike in remote, wide-open South African spaces he found himself on a 10 000km journey that tested his courage and determination through blizzards, lightning and hail storms as well as forty degree heat. Each successive expedition seemed to lead to yet another hidden corner of the country that beckoned to Kevin and his bike. On his journey, Kevin completed the Freedom Challenge, the Spine (the Drakensberg from end to end), the Ride to Rhodes and the Ganna (Beitbridge to Cape Town). Two of the longest rides, 5 000km in all, are ridden solo. This is his story – why athletes push themselves to rise to the challenge of extreme sport – as well as an account of the country and the incredible warmth and support from locals who reach out to help in so many ways. Kevin Davie has a passion for endurance sport and in addition to his exploits on the bike has earned his green number (10 finishes) at the Comrades and has completed 23 Dusi canoe marathons, including four each with his wife Lucille and son Dillon. As a journalist he was a Nieman Fellow in 1995/6 at Harvard University and divides his working time between the Mail & Guardian where he edits the business section and Wits Journalism at the University of the Witwatersrand where he teaches financial journalism.